President Obama extracted a guarantee from Israeli Prime Minister Benjamin Netanyahu that Jewish construction in most of the West Bank and eastern Jerusalem will be frozen for months to come, according to a senior Palestinian Authority negotiator. Last November, under intense U.S. pressure, Netanyahu agreed to a temporary halt to new Jewish construction in the West Bank. The prime minister claimed at the time he would not extend the freeze beyond its 10-month deadline, which is set to expire in September. Following his White House meeting with Obama Tuesday, Netanyahu sidestepped questions about whether he was prepared to extend the West Bank construction moratorium beyond the September deadline. 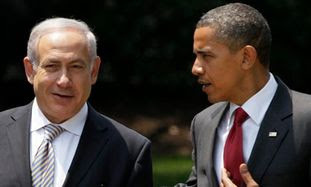 However, the PA negotiator and other PA officials told WND they were satisfied with the Obama administration's explanation that the U.S. extracted from Netanyahu a concession that he would not allow any new construction in both the West Bank and eastern Jerusalem besides the main "settlement" blocks – meaning the towns of Ariel, Maale Adumim and Gush Eztion. While Netanyahu openly pledged a 10-month freeze to West Bank Jewish construction, he has claimed he will not agree to a similar moratorium in eastern Jerusalem. On the ground, however, there have been almost no new building projects in eastern Jerusalem for more than four months. Staff members of the Jerusalem District Planning and Building Committee reportedly have been instructed by Netanyahu's office to halt their work. The order followed a public spat with the Obama administration after housing was approved for 1,600 new homes in an already-existing Jewish community during Vice President Joe Biden's visit to Israel in March. At the time, the White House slammed the construction approval as an "insult" and an impediment to peace. Netanyahu, meanwhile, said yesterday Israel is prepared to take additional steps to ease Palestinian movement in the West Bank, referring to the removal of anti-terror roadblocks and checkpoints. Previously, the removal of such barriers many times led to an immediate increase in terrorist attacks from those locations. One day after meeting with Obama at the White House, Netanyahu yesterday repeated a call for a restart of direct negotiations with PA President Mahmoud Abbas. Netanyahu said he was prepared to take steps including "additional easing of movements" and some economic projects. "The point is, we are prepared to do them. But what we want to see finally is one thing: We want President Abbas to grasp my hand ... to shake it, sit down and negotiate a final settlement of peace between Israel and the Palestinians," he said. Israel's Haaretz newspaper reported that Defense Minister Ehud Barak of the left-leaning Labor Party claimed there was more to the White House meeting than published. Barak told the Israeli newspaper Haaretz that Netanyahu had shown Obama that he was serious and was prepared to meet Palestinian demands regarding restarting talks. The Palestinians have called for a complete halt to Jewish construction in the West Bank and Jerusalem as a precondition for restarting direct negotiations.